Josh Kline’s Comfort Food, 2017 (pictured above) looks like a dust covered heap of discarded rubble. In this cast sculpture, and an overall theme in his art, he conveys the remains of a dire world, dystopian, apocalyptic, and post-human. MASS MoCa, a reconverted factory in North Adams, Massachusetts, with capacious exhibition halls can accommodate large-scale art works, perhaps more than any other art museum. Considering other vast visual art buildings, such as, Dia: Beacon, White Cube in London, the Hermitage in Russia, and Hauser and Wirth’s new expansive gallery in NYC, this is saying a lot. The huge scale of the building and of the immense interior spaces within MASS MoCa create an optical illusion making the works exhibited in them seem smaller than they actually are. As I stand in one of the exhibition chambers, I wonder, how do the artists who exhibit here visualize how their art will fill the spaciousness? I presume not many have studios as large. I ponder, where and how do they find the space to create such massive constructions? And what will become of these large-scale works once the exhibition ends? In the case of the artist, Xu Bing and his installation Phoenix, he answered these questions. Stepping back for a better vantage point to take in the immensity of the suspended birds, I bumped into a ledge installed along the wall. It held copies of a text that accompanies the art–the story of the creation of the mythical birds. Slowly I walked the length of the room reading page by page, the start to the present, the birth of the Phoenixes (‘Feng’ and ‘Huang’); and, indeed Xu Bing alludes to them as being born, taking on a life of their own. He relates that within the time of their ‘hatching’ two collaborators on the project, who helped create the Phoenixes, also gave birth to children. This coincidental occurrence of creating new life offered deep symbolism for Xu. 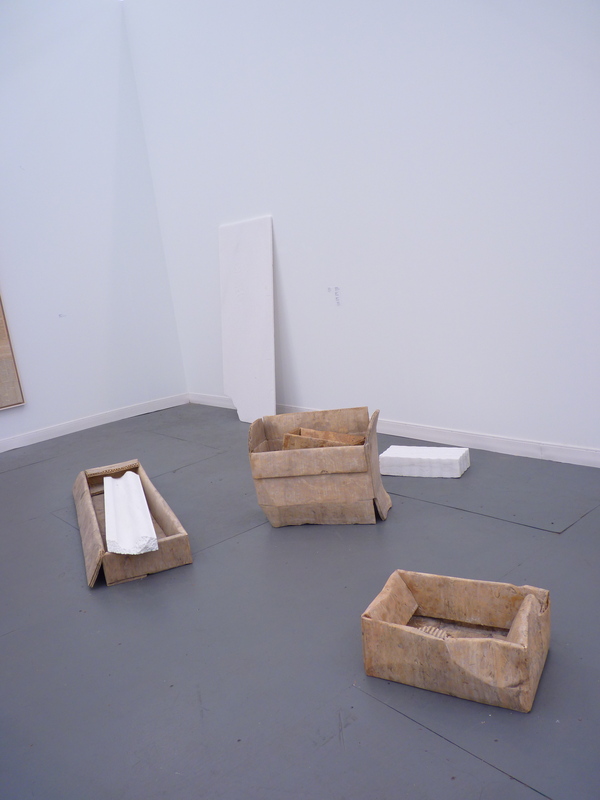 It offered another layer to the materials used for the sculpture, the collaborators, and the resulting art object. Standing under Phoenix, two gargantuan birds suspended from the ceiling, I had the sense the sculpture possessed a spirit, as if alive. 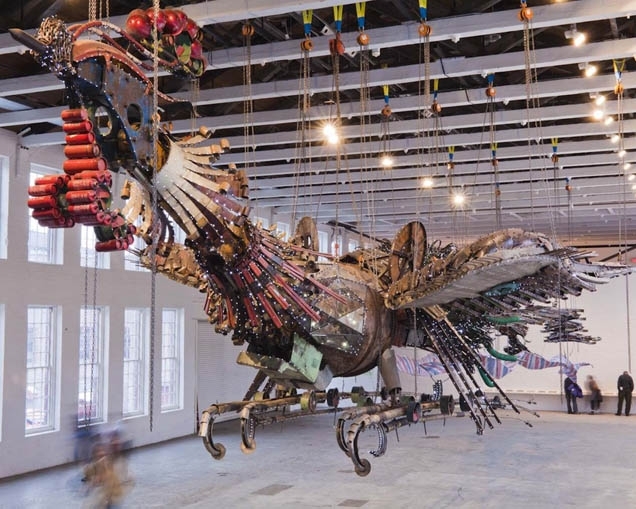 Made from construction-site essentials, such as hard hats and shovels, as well as construction debris like rusted corrugated metal and striped plastic tarp, the two Phoenixes take up the entire length of the main exhibition space, appearing to have been constructed specifically for MASS MoCa. 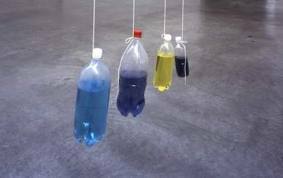 However, Xu’s art journal explains that when he began this art project MASS MoCa wasn’t even a remote contributing thought to his creation. The Phoenixes began as commission for one of Beijing’s glitzy new skyscrapers. I saw the life within the sculptures that came from all of the people who worked the construction site, who wore the hard hats, who dug the dirt with the shovels, who labored to build both the towering skyscraper and the sculptures. Their toil and sweat are the life within the art. One cultural critic, as mentioned in Xu’s journal, has likened the Phoenix Project to Diego Rivera’s mural of the Mexican laborers. 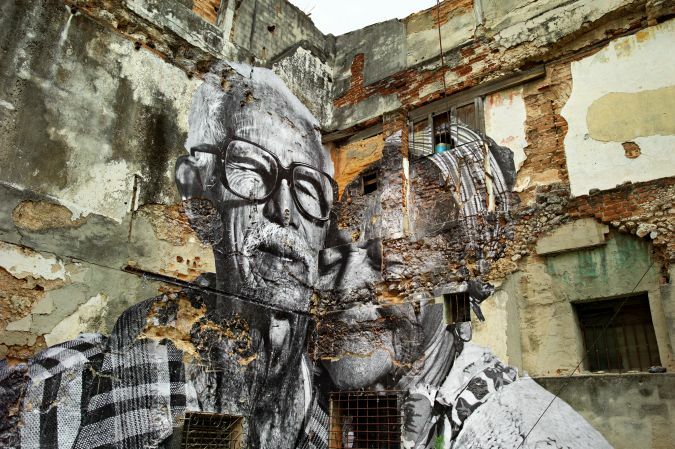 In Vic Muniz’s Wasteland project and JR’s global photomurals, these art projects bring people together as collaborators with the artist and the art creation. Inseparable, the artist, those who inspire, those who work in the creation, and the art made from debris and by the people all become one. Soaring with the spirit of the Phoenixes, I cruised down highway 2 to the Clark Art Institute in Williamstown. 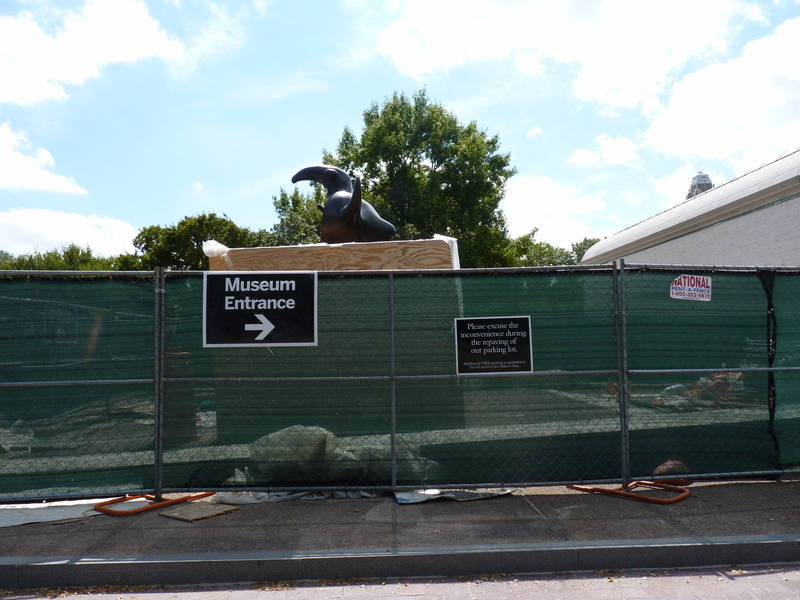 Entering the museum I detoured through the fenced and roped-off areas surrounding the building and beyond. The Clark Art Institute, like SFMOMA, the Whitney Museum of American Art, the Kimball art Museum, and the Coleccion Jumex in Mexico City is one of the many ever-expanding art museums that are either newly completed, under construction, or about to begin. Wandering the galleries in the Clark, I stopped to look out the window to the men in hard hats driving the tractors and pounding the metal stakes into the steel beams. 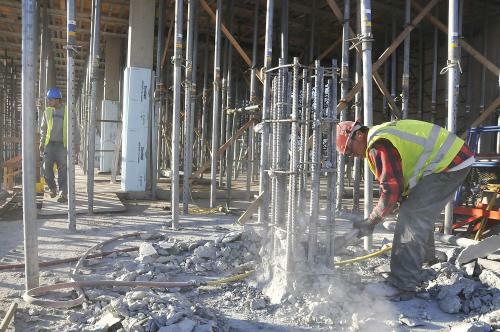 I reflected back on Xu’s artistic monument to the hard working construction laborers. Paradoxically, I couldn’t help but wonder, while considering all this construction done in the name of art, are art museums simply a polished dump for too much cultural debris? Perhaps this resonation was a symptom of an oversaturation of art by attending too many art fairs where there seems to be an abundance of inventory from prolific artists; and, I wonder from all this creative production and consumption what will sustain and remain of value as a cultural recording of this time in civilization? I wonder, in our current prosperous art culture with massively monumental works created by artists, with an abundance of global art museums and private collectors building art sanctuaries or ‘warehouses’ for their collections, are we building temples for our creative mass consumption? Andreas Lolis sculpts marble renderings of Styrofoam packaging, cardboard boxes, and plastic water bottles. Discarded debris becomes inspirations for this artist to solidify and immortalize into stone, actually turning our debris into marble artifacts. Other artists use trash as their medium. 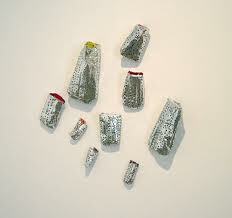 Tony Feher, I have nicknamed the garbage artist, due to the fact that his material can be discarded foil chip bags, cardboard boxes, to plastic water bottles. 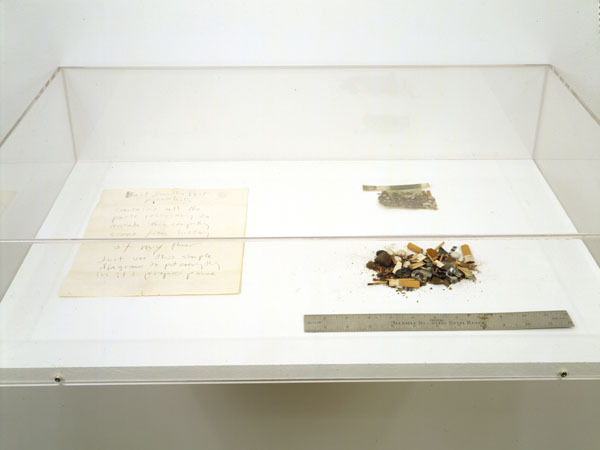 In Blast From the Past (1972-73), Gordon Matta-Clark swept up all the debris on his studio floor, put the contents in a box with instructions on how to display this dust and cigarette butts; and, even now, from his grave, he asserts an importance to what most people discard to the waste bin day after day as symbolic to their individuality. Trashed Mailbox by Cady Noland symbolizes the bygone American Dream. And, purposefully, this image captures my handheld device which represents the ever-present form of communication via text, twitter, and emailing which is increasingly replacing post cards and hand-written letters. 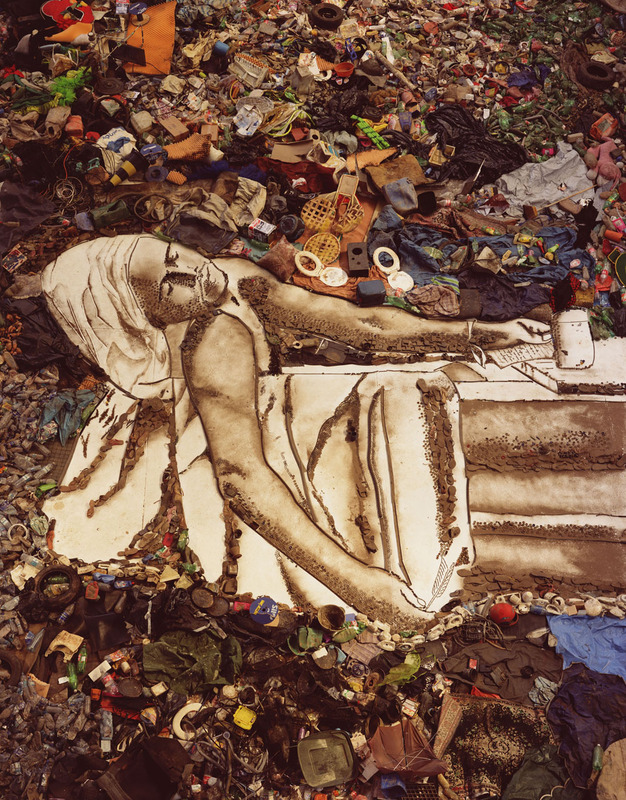 If art is a cultural recording of our history, what does it say about our present moment that artists like Xu Bing and others create art from our waste, using ever-expanding variations of garbage? Furthermore, if it survives how will future societies interpret these art objects? Hopefully, it may make one pause, about our mass consumption, to take note of the everyday detritus in our lives. Something to think about before you quench your thirst from a single-use plastic water bottle rather than carrying a reusable container, or toss away your plastic straw that you used for two seconds to stir your cocktail. And, I wonder, what art will remain, which museums will endure over time, and what ruins shall tell our story, many years from now?